Even when CPR is performed, many bystanders do not perform efficacious CPR. Thus, their action, while noble, may not lead to increased survival. Good CPR matters. [xi][xii][xiii] Commonly, bystanders do not begin CPR soon enough, don’t push hard enough or fast enough. The importance of high retention of CPR instruction, leading to action, can’t be overstated. Higher retention of CPR course curriculum will result in greater CPR response and greater response will save more lives. Now, how can we teach more effective CPR courses, leading to better comprehension of course material? “CPR courses give us an opportunity to share stories and describe the traumatic events related to cardiac arrest. This helps us break down barriers that lead to inaction. Ideally, if we’re able to describe what cardiac response is really like, we can better prepare course participants,” states Ross French, EMT-P, instructor for Annuvia, a national American Heart Association training company. And Ross should know. He, himself, has responded to hundreds of CPR calls and performs CPR on patients daily as a paramedic with the Rural/Metro in the busy Santa Clara County system. 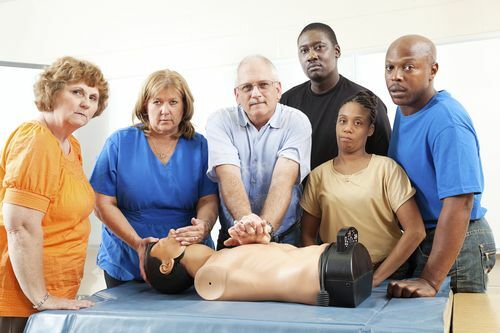 While CPR courses are typically taught to small groups, CPR instructors are public speakers. Using certain techniques, public speakers can improve comprehension of material delivered and engagement of their audience. In “Talk Like TED: The 9 Public-Speaking Secrets of the World’s Top Minds,”[xvii] bestselling author and communications coach Carmine Gallo breaks down hundreds of TED Talks – world famous speeches and presentations, which are delivered by the world’s most brilliant thinkers and have been viewed over one billion times – to identify the presentation tactics, skills and commonalities used by the best of the best. As Gallo describes, a physiological impact can be made between speaker and listener. He shares the research of scientist Uri Hassan, assistant professor of psychology at Princeton University, who used a functional MRI (fMRI) to study brain activity by tracking changes in blood flow. More blood flow in more areas of the brain indicates “brain-to-brain coupling” or connection between speaker and listener. While traditional CPR courses are heavy on videos, a stronger connection between speaker and listener can be found through storytelling. “Personal stories activate the whole brain, activating language, sensory, visual, and motor areas. Storytelling leads to more blood flow to different parts of the brain, leading to more comprehension and connection between speaker and audience,” states Gallo. In addition to storytelling, having a conversation with the listener is vital to retention and comprehension. “Communication is a shared activity resulting in a transfer of information across brains. During successful communication, speakers’ and listeners’ brains exhibit joint, temporally coupled, response patterns. Moreover, more extensive speaker–listener neural couplings result in more successful communication,” writes Hasan. So, how can CPR instructors become better speakers? 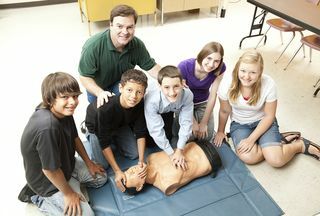 “I believe storytelling can help CPR instructors become better communicators,” says Gallo. “Stories of personal experiences or stories about other people (case studies) are highly effective learning tools. Stories inform, illuminate, and inspire. Tell more of them!” Better comprehension of a CPR instructor’s message, through storytelling, will lead to increased bystander intervention, thus saving more lives. Who ever thought telling a story could save lives? ii Christian Vaillancourt MD, MSc. “Evaluating the Effectiveness of Dispatch-assistedCardiopulmonary Resuscitation Instructions.” Academic Emergency Medicine. Volume 14, Issue 10, pages 877-833, October 2007. Web. June 29, 2015. Resuscitation Instructions.” Academic Emergency Medicine. Volume 14, Issue 10, pages 877-833 October 2007. Web. June 29, 2015.
xvii Carmine Gallo. “Talk Like TED: The 9 Public-Speaking Secrets of the World’s Top Minds.” St. Martin’s Griffin. March 10, 2015. Print. Thanks for sharing your feedback. I agree that too many stories can be overkill (perhaps this was an omission in the article). The point I was trying to drive home is that it’s important to form an emotional connection with the audience, activating as many parts of the brain as possible, in order to maximize the retention of material. And, telling stories is a great way to accomplish this goal. This doesn’t mean we need to overwhelm students and only tell stories! If the students feel like too many stories are being told, I’d argue that a strong enough emotional connection hasn’t been formed around the story and that the story isn’t hitting different parts of the brain or too many (incomplete) stories are being told or, perhaps, the participants don’t want to be in the training in the first place, in which case its even more important to find a bond and break down these barriers. What kind of stories do you find work the best? Thanks for your comment. Based on your feedback, I think I figured out where I may have mislead the audience with this article. By sharing a lot of sources in the article above, it may have been implied that this type of sourcing is good to use during CPR courses. This was not my intention and couldn’t be further from the truth. This article was intended for folks like you, who know the jargon, not lay people! Sharing stories to form a bond between speaker and audience requires the stories to be relevant to the audience (or for the speaker to make them relevant). Therefore, if we’re to share medical jargon with lay people, it wouldn’t be relevant and wouldn’t “activate” the brain. Thus, there likely wouldn’t be any improved retention of the material. If, however, the stories relate to the audience, such as a rescue you were on that involved a similar workplace (and what role each person played during the rescue), I’d argue the audience would greatly retain the info.